Highly pathogenic avian influenza viruses (HPAI) continue to pose a significant economic disease burden to the poultry sector worldwide. In 2017 fifty one countries notified the OIE (OIE) with an immediate notification or a follow up report about outbreaks of H5Nx (where x is N1, N2, N5, N6, N8) and the LPAI H7N9. The outbreaks were observed in Asia, Europe, and North America. These numbers might indicate that the cases detected might be due to more and improved surveillance programs. But it is also possible that the different lineages became endemic in the wild bird populations in more regions. The high level of divergence of HPAI is possibly caused by reassortment (genetic shift) of circulating low pathogenic avian influenza virus (LPAI) with genomic sequences of HPAI associated with mutations in the HA also known as genetic drift. A difficulty in influenza A virus (IAV) vaccine development is to match the antigenic make up between the vaccine antigen and the circulating strains in the field. Vaccines which do not match the protein epitopes which induce the protective immune response provide limited protection. In order to address this problem an HA sequence of an HPAI H5N1 of clade 2.3.2 was optimized for the codon usage of insect cells and the original amino acid sequence was modified to induce a broader range of protective immunity against a variety of different H5 clades. A recombinant baculovirus encoding the above described sequence was generated and used for production of vaccine antigen in insect cells. The oil-emulsion based vaccine consists out of the recombinant H5 antigen and NDV LaSota strain produced in embryonated eggs. Mostly 10-days-old SPF chickens were vaccinated subcutaneously and challenge infection was performed at 21 days post vaccination with strains of different clades belonging to HPAI H5N1, H5N2, H5N6, and H5N8 from different regions. Shedding of the challenge virus was investigated up to 10 days post challenge infection. 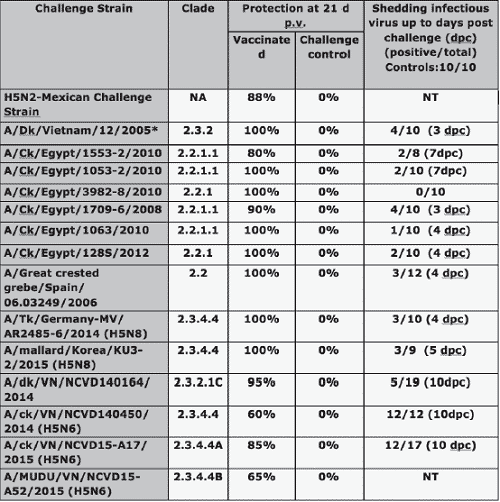 The results showed that protection between 80% to 100% was observed when H5N1 HPAI of different clades were used for challenge infection (Table 1). When HPAI of clade 2.3.4.4 was used for challenge infection a protection rate between 60% and 100% was observed indicating that there are differences in antigenicity within clades. When an H5N1 HPAI of clade 2.3.2.1 was used for infection again a high protection rate (95%) was observed. The HI titer measured with the challenge virus were in most cases <23, while a protection of ≥ 80% was observed. Furthermore it was observed in appropriate experiments that this vaccine can also be used for eradication since the DIVA approach on flock level is possible. The investigation of the virus shedding of the appropriate challenge virus indicated a rather short and low viral shedding when protection rates of >90% were observed. When the protection rates were lower the shedding of challenge virus was extended. In field studies where this vaccine was compared with vaccines based on inactivated LPAI H5N1 produced in embryonated eggs. The overall mortality rate and feed conversion rate was lower when the flocks were vaccinated with a vaccine containing the recombinant H5 antigen produced in insect cells. Surprisingly, under field condition elevated levels of interferon γ and IL6 were observed in flocks vaccinated with the here described vaccine. This indicated that the vaccine induced the activation of CD4-negativ as well as CD8 positive T cells which might broaden the immune response. The lymphocyte activating IL6 might also support the H5-directed immune response. It needs to be mentioned that the exact mechanism of a possible activation by the rec-H5 based vaccine needs to be further explored. In summary the use of genetically engineered H5 antigen expressed in insect cells can be used for vaccination in commercial operations. The use of vaccines should always go hand in hand with increased biosafety and a good management practice.